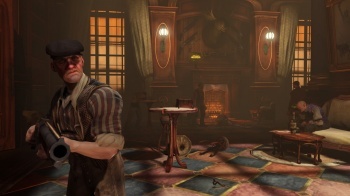 Irrational Games wants to name one of BioShock Infinite's emporiums after you. There are only so many names to go around, and Irrational Games needs yours to help with the development of BioShock Infinite. A new contest will reward entrants with a permanent part in the game's world. Irrational's aptly named "Get Your Name in the Game" promotion reveals that certain establishments in BioShock, such as Sinclair Spirits and Robertson's Tobaccoria, were named after studio staff. Now, the company wants to do the same, but with fans. Anyone that wants to submit their names should go here and do so by April 13 at 11:59pm Eastern Time. Irrational says that accepted names will be used for "a building, a character, a business-whatever our artists come up with." Whoever gets to be a surly bartender is one lucky fan. That, and perhaps a crazy, glowing-eyed politician or the owner of a fiery grocery, as seen in BioShock Infinite's gameplay trailer. Just remember that Columbia needs button-makers too.